The What: Yamaha Unified Communications is now shipping the Yamaha YVC-200 portable USB + Bluetooth speakerphone for conferencing anytime, anywhere. Available in select worldwide regions, the portable conferencing device is designed to provide users with ample, clear sound no matter where they work by leveraging Yamaha's superior audio technology to boost productivity when meeting remotely. The What Else: The YVC-200 speakerphone is the ultimate portable device for on-the-go communication. The compact device fits in the palm of a user's hand and is integrated with Yamaha's leading sound processing technologies, including adaptive echo cancellation and Human Voice Activity Detection, which focuses on speech rather than background noise. 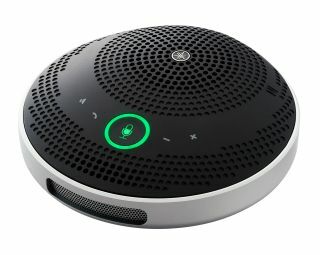 The unit features an intelligent microphone and delivers full-duplex conversation without sound dropouts, even when multiple people are speaking at once. In addition, a powerful built-in speaker produces audio that sounds so natural, it feels as if every remote participant on the call is in the room. With the YVC-200, users can easily hear what's being said and be heard, enabling highly productive team collaboration anywhere. To start a remote meeting, users connect the YVC-200 to their audio, video, or web conferencing client. Equipped with USB and Bluetooth, with fast pairing to NFC-enabled devices, the YVC-200 can connect to a PC, smartphone, or tablet. The built-in rechargeable battery provides up to 10 hours of operation. It is software-agnostic and fully compatible with commonly used OSs and remote conferencing services, such as Skype for Business, Microsoft Teams, Cisco Webex, Zoom, Slack, and more. In addition, interactive touch-sensor buttons for easy and intuitive operation provide manual control of software functions, such as microphone mute and speaker volume. Users can start a meeting anytime, anywhere, including ad-hoc meetings in the office or a customer's site, without missing inspired ideas or cues for making immediate decisions. The Bottom Line: Available in a choice of white or black, the YVC-200 blends into any home or corporate office. Its small, lightweight, and space-saving design is perfect for portability and deployment at laptop or mobile terminals. A headset jack allows for private listening and the option to enjoy music through the unit between calls.